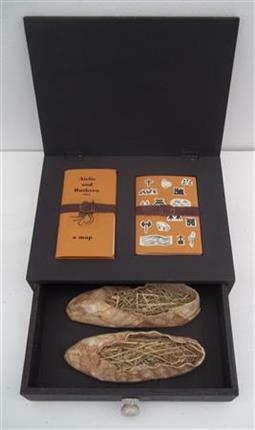 A pair of shoes made from a single piece of canvas with a central seam was sewn in twine. The design of the shoes was based on the Rivelino, worn in Scotland in the early 14th century and continued on into the early 20th century in Orkney and Shetland where they became known as Rivlins. 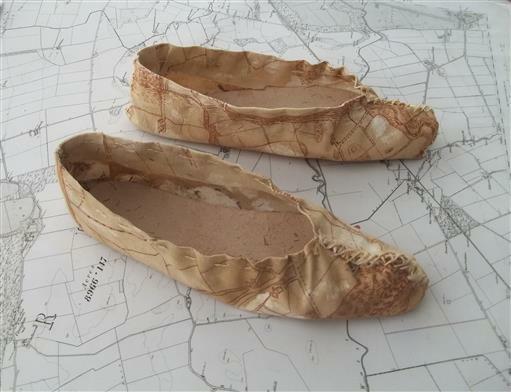 The shoes were decorated with a section of an old map of Airlie from 1869, drawn on to the canvas. During the process of drawing the map I discovered a road leading to the old school and the mill in Ruthven, which is now no longer there. This route was walked wearing the shoes. The soles of the shoes bearing the image of the path coming into contact with the old path itself, fusing both in an intermeshing of time and place. My footsteps left behind yet another layer on top of countless impressions produced by humans and animals over hundreds of years. Travelling over the surface of the ancient path and through the mapping of my journey I became aligned to my environment physically, geographically and culturally. The study of the map released an understanding of time, offering a window into the history, geology and sensibility of the place. 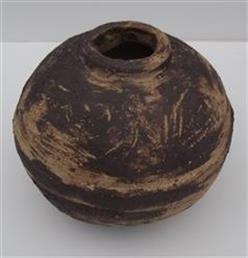 The markings of souterrains, wells, Neolithic burials, standing stones, castles and places bearing the names of monks and battlegrounds inspired the making of a series of objects and a cartography notebook.